April 17, 2017, 10:30 a.m. Twain has no editor. It uses custom algorithms to find stories it thinks are trending around the Internet. By Joseph Lichterman @ylichterman April 17, 2017, 10:30 a.m. The news and information we consume is becoming increasingly tailored to our interests and habits. Our Facebook feeds are algorithmically controlled, and publishers such as The New York Times — which is reportedly planning a personalized homepage — are also attempting to mold their content to readers’ preferences. Twain has no human editors. Instead, it relies on “100 custom-designed algorithms and processes” to scan sites around the internet and judge what’s most popular at that moment, said Twain founder Miran Pavic, who is based in Croatia and is also content director for Croatian news site Telegram. Many of the factors that the app takes into consideration — the numbers of shares, retweets, and likes — are straight from social. But this is an attempt to “distribute it in a way that’s not going to be in a bubble,” Pavic said. 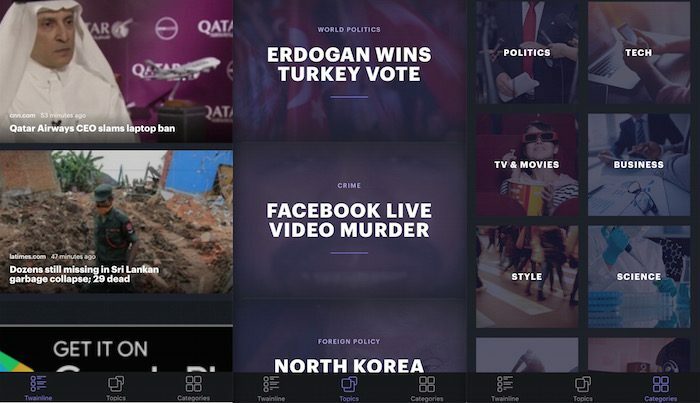 The app is divided into three sections — a main timeline; individual news topics, such as North Korea’s recent failed missile launch or the new Star Wars trailer; and categories, such as politics, style, and sports. “The idea is to get the editor out of the way,” Pavic said. The app scrapes sources ranging from Reuters and CNN to Medium and Reddit. The algorithm, Pavic said, weighs factors about how articles are being shared across the internet, then surfaces those it deems to be above average. “The idea is really to find stuff that’s extraordinary,” Pavic said, though he didn’t want to go into too much detail about how the process works. 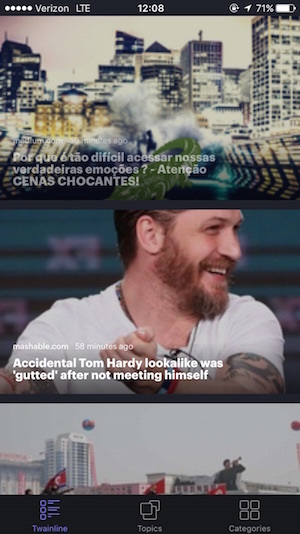 On Sunday afternoon, the top stories on Twain were a Portuguese Medium post about why it’s so difficult to access our true emotions, a Mashable story on a Tom Hardy lookalike, and a Vice dispatch from Pyongyang. 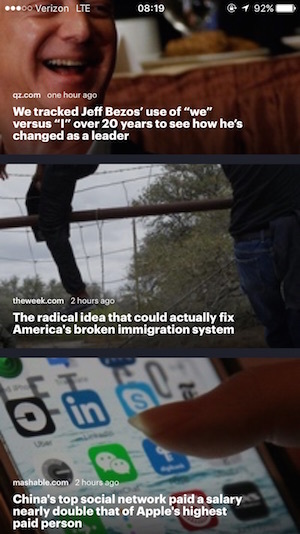 By Monday morning, the lead stories were a Quartz story on Jeff Bezos’ language and leadership style, a piece from The Week about the U.S. immigration system, and another Mashable story on the top salary at a Chinese social network. He argued that fake news is able to thrive on platforms like Facebook because News Feed is designed to promote stories it knows you will agree with. The challenge for Twain — and most apps, for that matter — is to get users to download it, in a time when, according to a Pew report last year, 44 percent of Americans already get their news from Facebook and most use only a handful of apps. There’s also no dearth of news discovery apps. For now, Twain is only available on iOS, but Pavic said there are plans to launch an Android version as well. Twain has received some seed funding and may ultimately sell ads within the app. POSTED April 17, 2017, 10:30 a.m.
Lichterman, Joseph. "This news app starts with the premise that news discovery has become too personalized." Nieman Journalism Lab. Nieman Foundation for Journalism at Harvard, 17 Apr. 2017. Web. 23 Apr. 2019. Lichterman, Joseph. "This news app starts with the premise that news discovery has become too personalized." Nieman Journalism Lab. Last modified April 17, 2017. Accessed April 23, 2019. https://www.niemanlab.org/2017/04/a-croatian-news-app-starts-with-the-premise-that-news-discovery-has-become-too-personalized/.